Why a website when we seem to be inundated with too much information? To us as unbelievable as it sounds, we could not find many unbiased opinions/information about charter sailing, the ins and outs, the suggestions, the how-tos, the do-nots, etc. The charter companies and suppliers are all out there, but we wanted to know direct ly from sailors “in the same boat”….so we are hoping that everyone with a story, tip, or other related information will be willing to share. 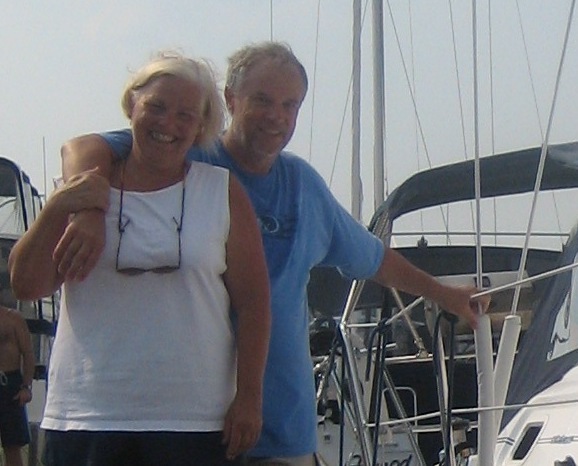 Claire and I (Charlie Sasser) started sailing, soon after we were married in 1972, in the upstate of South Carolina (3 to 4 hours from blue water). Our interest in sailing happened quite by accident when we borrowed my father-in-law’s ski boat, but saw that the Sunfish sailors were having more fun. So we purchased a Sunfish and towed it to the lake behind our ‘72 MGB (a sight to behold). We moved to the Boston area in the early 80’s and sailed with our new friends on their Cape Dory 24, then their Cape Dory 28 and finally on their custom built Bristol 35.5. Claire will tell you that since 1972, I have always had a passion for sailing, so in the fall of 2002 (after kids were grown), she pushed us to take the US Sailing Basic Keelboat Certification course from Ocean Sailing Academy in Charleston, SC (We’ll tell you about that another time). Now certified, we chartered J24s a few times for day sails and then became a partner for a short time with a fellow student from Charleston who had purchased an O’day 28 …short enough to decide owning a boat didn’t make sense for us. In the summer of 2005 we decided to charter a sailboat on Lake Champlain for what would be our first REAL cruising experience and what appeared to be a good environment for learning, before we took on the BVI, etc. But first with Claire’s encouragement (and for a little confidence building) I took the US Sailing Basic Cruising Certification from Ocean Sailing. For Charlie’s professional profile (from his day job), you can visit LinkedIn. In the spirit of full disclosure, we plan to incorporate some ads in the future on this site and develop some quality affiliate relationships with charter companies and others to help cover our costs and the time of hosting this site. We promise to only recommend products and services that we have either used or have fully researched based on recommendations from our trusted friends, associates, and bloggers.